* Topical studies and workbooks for classes, family studies, or personal instruction. * Professionally printed with full-color covers. Explanation and practical applications for diligent Bible students. Written from the perspective of faith in the Bible as the absolute, inerrant, verbally inspired word of God. 6" x 9" each. Careful studies of vital Bible topics. 6"x9"
Bible guidance for improving marriage, solving marriage conflict, and raising children to serve God. 150+ pages. Retail $9.95. Resource material to strengthen faith in God's existence, Jesus' Deity, and the Bible as God's inspired word. Over 130 pages. Retail $8.95. Individuals in the Godhead, Deity of Jesus, nature and indwelling of the Holy Spirit, spiritual gifts. Over 150 pages. Retail $9.95. Grace, Faith, and Obedience: The Gospel or Calvinism? Bible teaching about original sin and inherited depravity, election and predestination, grace and mercy of God, falling from grace, faith only or obedient faith. Over 130 pages. Retail $8.95. Bible teaching about life in the womb with application to abortion. Includes illustrated charts (no pictures of aborted babies). 48 pages. Retail $6.95. The Kingdom of Christ: Future Earthly Millennium or Present Spiritual Reality? Does Jesus' kingdom exist? Is the church the kingdom? The spiritual nature of Jesus' kingdom. God's plans for the future of Israel. Premillennialism & Jesus' second coming. The AD 70 doctrine. Over 130 pages. Retail $8.95. Class books suitable for teens and adults. Minimal human commentary. Questions challenge students to personally search the Scriptures. 8 1/2" x 11." Retail $6.95. 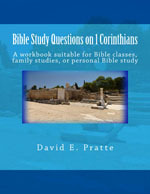 Questions and commentary on various Bible subjects; suitable for teens or adults. Changing yourself, Bible study, prayer, attendance, giving, human relationships, local church responsibilities, moral purity, church organization & work, church discipline. 8 1/2" x 11", 78 pages. Retail $6.95. Emphasizes Jesus Christ as the focus of God's eternal purpose. Overviews Bible history in 15 periods. Summarizes each book of the Bible in chronological order. 8 1/2" x 11", 92 pages. Retail $6.95. Why should you believe in God, Jesus, and the Bible? Is Jesus really your Lord? How can you be sure Jesus has forgiven your sins? Where can you find the church that belongs to Jesus? Where did the modern denominations come from? 6" x 9", 90 pages. Retail $6.95. Biblical reviews and evaluations of wholesome books for your children and family. 8 1/2" x 11", 54 pages. Retail $7.95. These books cannot be ordered directly from our site. Paperbacks must be ordered from Amazon.com and other such sources (many are also available in Kindle e-book format). To see a complete list of paperbacks, click here. Alternatively, click on links above to view specific books on Amazon. Follow Amazon procedure to order. Our hardbacks are published by Lulu.com. Click here for a complete list, ordering information, and discounted prices. Our books can also be ordered online from Barnes & Noble, Books a Million, Book Depository, AbeBooks, Wordery, and other online book sellers. Note that some books are also available for free in PDF or epub format at www.gospelway.com/commentary or www.biblestudylessons.com/books or www.biblestudylessons.com/classbooks. Prices effective April 15, 2019. All prices subject to change without notice. Click for a complete price list and order form. Contact us for dealer discounts. Visit our Bible study online libary.